Toyota may gain almost 1 percentage point of U.S. market share. DETROIT (Bloomberg) -- Toyota Motor Corp. is coming back strong in the U.S. This time, Ernie Boch Jr. sees it lasting. A year ago, as the company was recovering from record recalls, Toyota was like a woozy heavyweight boxer just returning to his feet, said Boch, a dealer 30 minutes outside Boston. Then, Japan's earthquake and tsunami hit in March 2011, halting vehicle assembly and leading to shortages from May through August. "The tsunami came, and just -- boom! -- right back down on the mat," said Boch, president of a Toyota store in Norwood, Mass. "The reduction of inventory hurt us. Now, it's back." The extent of Toyota's recovery will show in its May sales results, set to be released Friday. The Japanese automaker rode gains from new models such as the Camry sedan and Prius line of hybrids to a forecast 93 percent increase in deliveries of cars and light trucks, the average estimate of seven analysts surveyed by Bloomberg. As a result, Toyota and other Japanese automakers likely will show sizable gains in U.S. market share. Overall light-vehicle sales in May could surge 31 percent to 1.39 million, the average of nine analysts' estimates. Industry sales may run at a 14.4 million seasonally adjusted annualized rate, the average of 14 estimates, keeping the U.S. on pace for its best year since 2007. But the results will compare with a weak month last year. The May 2011 sales rate was 11.7 million, according to researcher Autodata Corp. 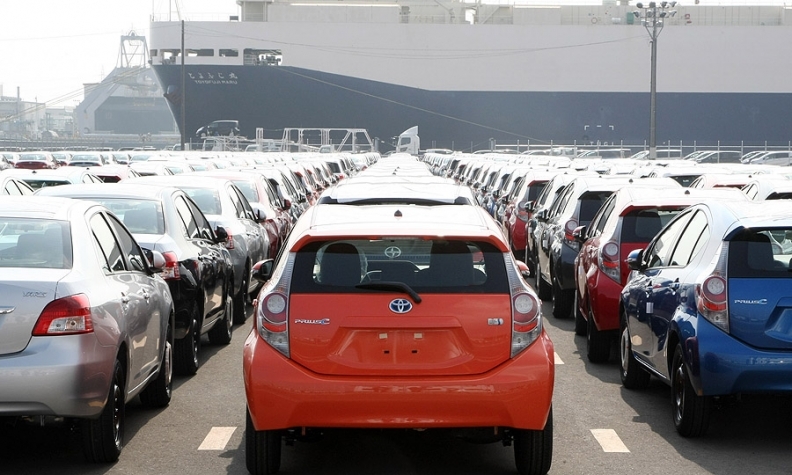 The year-over-year market share gains for Japan-based automakers are "artificial" because of their depressed results last year, Brian Johnson, an analyst at Barclays Plc, wrote in a May 24 report. Boch Toyota sold about 400 new vehicles this month, led by Camry and Corolla cars as well as Seqouia and Land Cruiser sport-utility vehicles -- which the dealership ran out of at times in 2011 -- Boch said. He boosted salaried pay for some employees last year to make up for depressed commissions when sales slid as low as 210 vehicles a month. "People are out there buying more than they were a year ago, and we have the bullets," said John Horton, president of San Francisco Toyota, where sales more than doubled in May from a year earlier. "Our hybrids are hot. Everything is moving." Toyota and Honda Motor Co., which analysts estimate reporting the industry's second-biggest sales increase, lost production of hundreds of thousands of vehicles after last year's tsunami in Japan and floods in Thailand. Toyota may gain almost 1 percentage point of U.S. market share this year and retain third place behind General Motors Co. and Ford Motor Co., analysts estimated earlier in the year. The Japanese company has recovered from the recall of more than 10 million vehicles in 2009 and 2010 related to unintended acceleration. In the first three months of this year, Toyota sold the most cars and trucks in the world. Toyota will probably remain No. 3 in the U.S. market for the month behind GM, which sold the most vehicles globally last year, and Ford, according to estimates. Honda deliveries may climb 53 percent, the average of seven analysts' estimates. The automaker entered May having reported year-over-year sales declines in 10 of the last 12 months, as the natural disasters sapped supply of Civic compacts, Accord sedans and CR-V SUVs. Chrysler Group LLC probably will lead U.S. automakers with a 40 percent sales increase from a year earlier, the average estimate of nine analysts. The automaker ran a national promotion the last 10 days of May, offering some buyers no monthly payments for 90 days. "The Japanese competitors are now back fully in the marketplace," Sergio Marchionne, CEO of Chrysler and its majority owner Fiat S.p.A. told reporters on May 24. "It's something that we have not had to deal with, effectively, over the last 12 months." GM and Ford may combine to gain about 1 percentage point of market share compared with April, Johnson wrote. GM's May sales probably rose 15 percent, the average of 10 analysts' estimates. GM's U.S. market share through April slipped 1.9 percentage points from a year earlier to 17.7 percent. GM shuffled its sales team on May 17, naming Alan Batey to the new position of vice president of U.S. sales and service. "GM had such an abundance of Chevy Cruze, which was a good substitute for Corolla and Civics" during Toyota and Honda model shortages last year, said Jessica Caldwell, an analyst at industry researcher Edmunds.com. "They had some good gains in 2011 that have been a little bit tougher to replicate in 2012." Ford sales probably gained 12 percent, the average estimate of 10 analysts surveyed. The automaker is adding production at some North American plants to keep up with demand and boost output by 400,000 vehicles on an annualized basis. "Sales of some hot-selling products such as Focus, F- Series with EcoBoost, and Explorer were impacted by tight inventory," Goldman Sachs Group Inc. analyst Patrick Archambault wrote in a May 21 report. "This is something that Ford is trying to address through increased capacity." Nissan Motor Co., which began production this month of its revamped Altima sedan, may report a 29 percent gain in deliveries for the month, the average of seven estimates. Korea's Hyundai Motor Co. and Kia Motors Corp. may combine to sell 17 percent more vehicles than a year earlier, the average of six analysts' estimates. Volkswagen AG, which is on pace to exceed its target for selling more than 500,000 vehicles in the U.S. this year, may increase combined sales of its Volkswagen and Audi brand vehicles by 33 percent in May, the average of four analysts' estimates. May had 26 selling days, two more than the year-earlier period.